As I write this first official reports confirm the existence of gravitational waves which Albert Einstein predicted a century ago. Ground breaking scientific discoveries such as this reaffirm to me the spatial relationships between the universe and human security issues, placing those issues into a new perspective that contrast with perspectives formed by our everyday lives. Nevertheless, for the majority of humanity, human security in its diverse manifestations remains the most significant consideration in their lives whereas the nature of gravity is hardly given a thought until such time when some clever technologist uses such a new insight and ends up revolutionising our lives. Abstract: This paper outlines how Brazil's latest public security initiative-its highly controversial Police Pacification Campaign (UPP)-is an integral component of a neoliberal political framework that is enacting rapid urbanization projects in and around strategically located favelas (informal settlements or slums) of Rio de Janeiro. Specifically, it evaluates what kinds of economic development initiatives are moving forward, how they are facilitated by the UPP, how they connect to the city's mega-events, and who is profiting from them. The article also examines how the pacification has affected residents in three favelas over a seven-year period from the inauguration of the UPP in 2008 through to mid-2015. Abstract: The mercenaries and mercenarism are two points of concern for scholars studying the rules of war throughout history. Both in jus ad bellum (JAB) and jus in bellum (JIB) we can find a framework of international law crafted to impede the participation of individuals motivated to take part in hostilities to get private gain. Nevertheless, paradoxically, the problem is when corporations are supported by domestic law to perform serviced in ground combats abroad. In the latter case, Human Rights Law (HRL), International Humanitarian Law (IHL) and International Criminal Law (ICL) present numerous gaps that make it difficult to incriminate corporations, which perpetuate the impunity among private organizations involved in human rights violations in conflict zones. Rio De Janeiro’s Olympic Legacy: Public Security for Whom? Abstract: As Rio de Janeiro struggles to hold itself together through the Games of the XXXI Olympiad, its much lauded public security Games plan, including its highly controversial police pacification program—long promoted as one of the cornerstones of Rio’s Olympic legacy—descends into a state of near total collapse. This paper takes an intimate look at what is likely the last days of this contentious pacification policy, the part it plays in the wider ‘Games Security Plan’, and how and why it has been implemented in the lead up to the 2016 Summer Olympics. Abstract: Background: The scene of a mass-casualty attack (MCA) entails a crime scene, a hazardous space, and a great number of people needing medical assistance. Public transportation has been the target of such attacks and involves a high probability of generating mass casualties. The review aimed to investigate challenges for on-scene responses to MCAs and suggestions made to counter these challenges, with special attention given to attacks on public transportation and associated terminals. Methods: Articles were found through PubMed and Scopus, “relevant articles” as defined by the databases, and a manual search of references. Inclusion criteria were that the article referred to attack(s) and/or a public transportation-related incident and issues concerning formal on-scene response. An appraisal of the articles’ scientific quality was conducted based on an evidence hierarchy model developed for the study. Results: One hundred and five articles were reviewed. Challenges for command and coordination on scene included establishing leadership, inter-agency collaboration, multiple incident sites, and logistics. Safety issues entailed knowledge and use of personal protective equipment, risk awareness and expectations, cordons, dynamic risk assessment, defensive versus offensive approaches, and joining forces. Communication concerns were equipment shortfalls, dialoguing, and providing information. Assessment problems were scene layout and interpreting environmental indicators as well as understanding setting-driven needs for specialist skills and resources. Triage and treatment difficulties included differing triage systems, directing casualties, uncommon injuries, field hospitals, level of care, providing psychological and pediatric care. Transportation hardships included scene access, distance to hospitals, and distribution of casualties. Conclusion: Commonly encountered challenges during unintentional incidents were added to during MCAs, implying specific issues for safety, assessment, triage, and treatment, which require training. Effectively increasing readiness for MCAs likely entail struggles to overcome fragmentation between the emergency services and the broader crisis management system as well as enabling critical and prestige-less, context-based assessments of needed preparatory efforts. 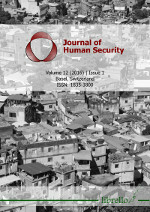 Abstract: This article addresses three research questions by elaborating on how the idea of human security is understood or defined by the government and social actors in China; how the distinction between the “protection” aspect and “empowerment” aspect of human security is understood and accepted; and what particular downside risks are perceived as pressing human security issues in China. Amongst these the major ones include air pollution, food security, and cyber security. The study reveals that, whilst as a term “human security” is not frequently used, there have been significant discussions leading to the consideration and implementation of various human security practices in China. The idea of human security has been firmly established and threats to human security detected. For both the government and academic community in China, human security and state security are not necessarily confrontational but can rather be combined, often complimenting each other. Recent developments in China are pointing to a positive direction in terms of human security in the country. Abstract: Author and Scholar Seug-Whan Choi's "New Explorations into International Relations: democracy, foreign investment, terrorism and conflict" serves as a nexus of interdisciplinary analysis and findings rooted in evidenced based research. Indeed, the author set out to challenge and test traditional international relations (IR) theories by implementing rigorous scientific methods in an attempt to produce policy recommendations and encourage a frameshift in methodological approaches. One underlying theme that recurs throughout this work is the requirement for rigorous statistical analysis and education in the field of political science. This has already begun and a re-emphasis is encouraged and greatly welcomed.